I am finally getting around to posting photos of some of the shirts I drafted and sewed for my husband, Roger. Since his birthday, our anniversary, and Father's Day are all within a few days of each-other....I ended up making him quite a wardrobe of new shirts! Here are the first 3, I'll work on uploading the rest as I find the time. 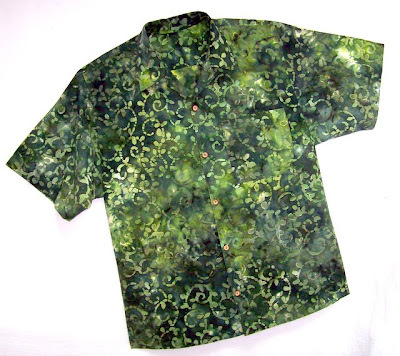 The classic 'camp shirt' style, pictured above is made from a lovely cotton batik found at Fabric.com and features wood buttons. 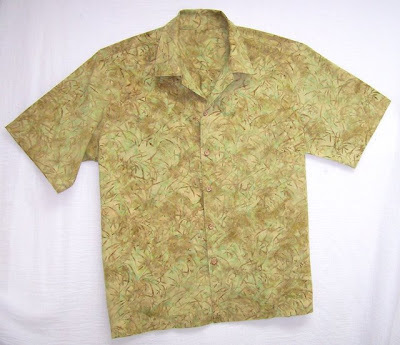 This dark green batik Camp shirt (below) was fashioned from fabric found at JoAnn Fabrics, and also features wood buttons. 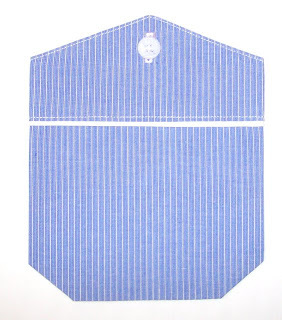 This blue and white micro stripe band-collar shirt is made from buttery soft Italian Cotton Shirting fabric, found at my new favorite fabric-binge shopping site.... Gorgeous Things ! It features a new pocket design I'll be introducing to clients, a "peaked top" pocket with piping detail. OMG, I just love that pocket! I can't wait to see the design. That is just stunning. Nice Pam. Love the peaked pocket. Pam, I love your shirts and so does my sweetheart. He's partial to the blue banded collar shirt. Do you draft the pattern or did you work from a commercial pattern? I am flattered you like my work, thank-you! I draft nearly all my patterns myself. 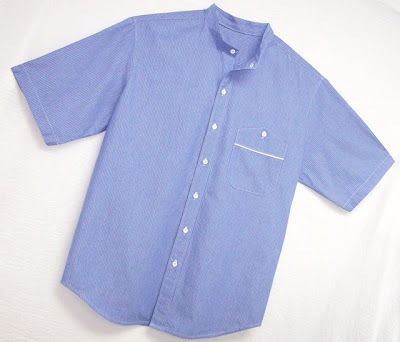 However, look to the mens shirt patterns at www.IslanderSewing.com ...their patterns are very well drafted and have wonderful instructions. Pam, Your work is outstanding...and insprirational! The recipients of your shirts are very lucky. And who knew that Jo-Anns had batiks of any kind, let alone a nice one like that.